Beverly Crawford is a famous Gospel singer, known for her work with Bobby Jones on BET as well as being a regular on the Stellar's. She sings and gives performances around the country and is loved by all. She is known in the same circles as Dorinda Clark Cole. 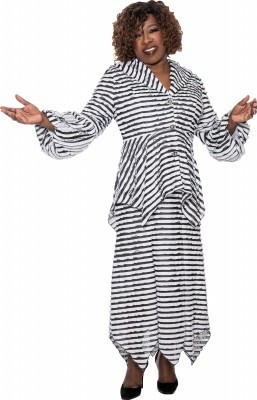 The line developed for her by Divine Apparel is a soft & casual two and 3 piece set look, unconstructed and flowing. 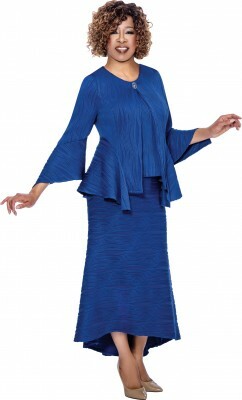 The fabrics are better and the styles are not too fussy, so her line is called "Couture Simplicity". At Divine Apparel, we make most every style in both misses and woman's, Beverly Crawford Couture Simplicity is not different. Since Beverly Crawford is a size 14w we start our W's in size 14W.